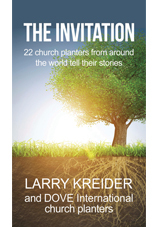 22 church planters from around the world tell their stories. When Jesus ascended into heaven he left a spiritual family of 120 believers in an upper room. By planting new churches, we continue what Jesus started. This book contains stories of ordinary people from five continents. They trusted in an extraordinary God, became spiritual fathers and mothers and planted a new unique church in their community. Through their obedience, many have come to faith in Christ.